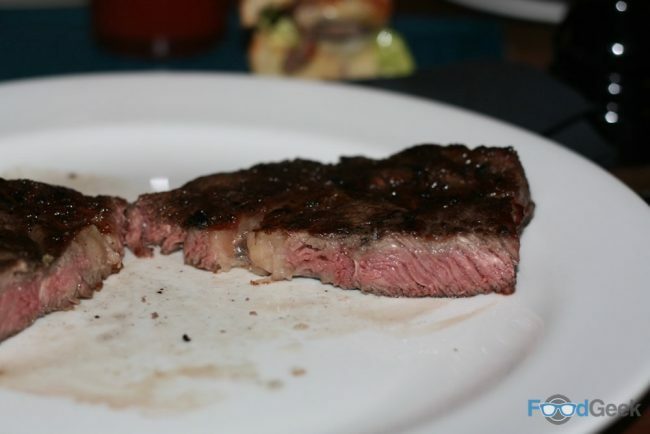 Until this year the best steak I’d had in Manchester was over 15 years ago. 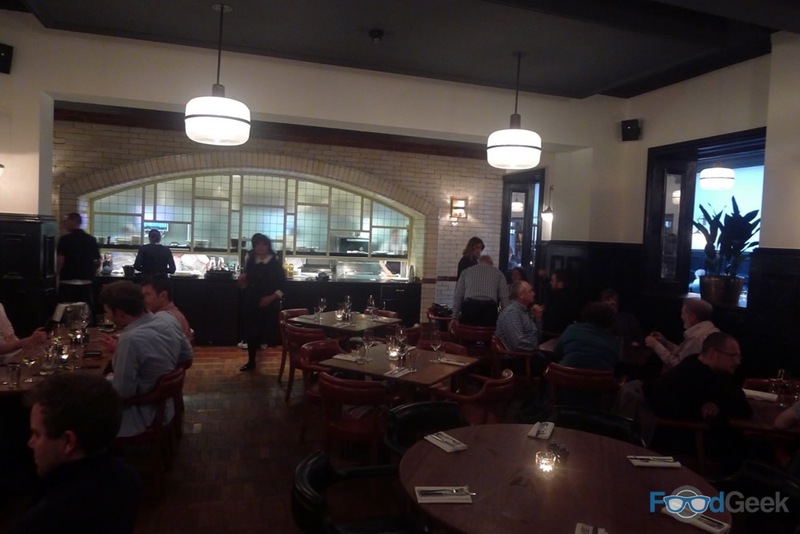 It was at the newly opened Gaucho Grill, one of the first nice restaurants I went to when I could afford to eat out on my own. I’ve had some decent steaks since. 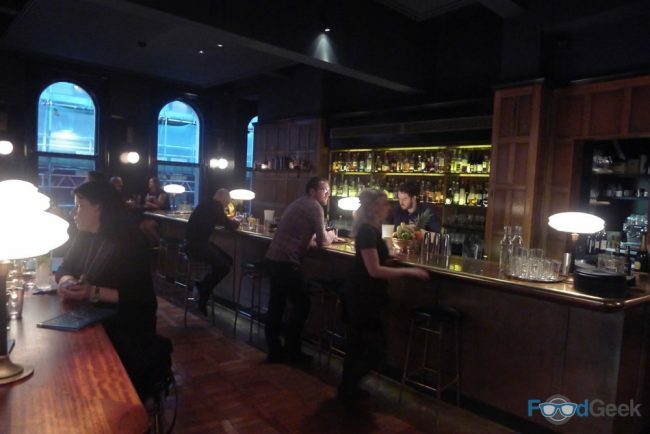 At the likes of Grill On The Alley, The Lowry Hotel and perhaps surprisingly, Solita. 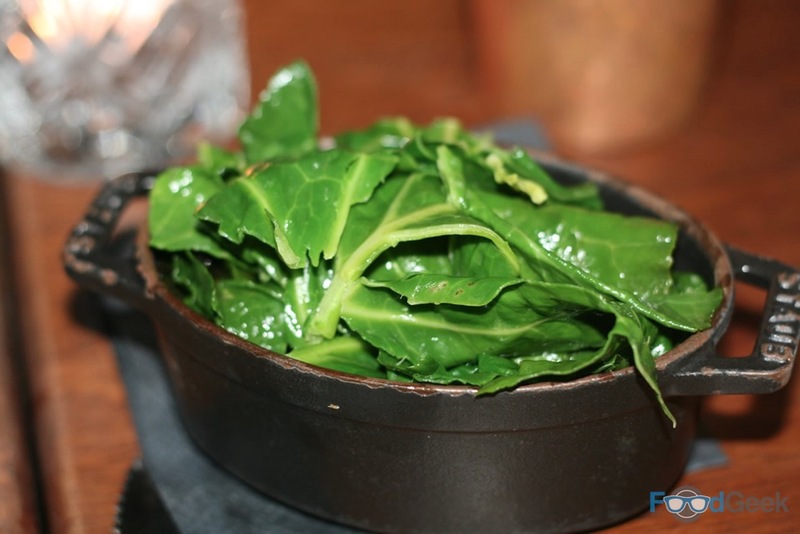 But nothing could match that first time at Gaucho. So many restaurant brands have arrived from London lately. It’s hard to keep up with them all, let alone be excited by most of them. 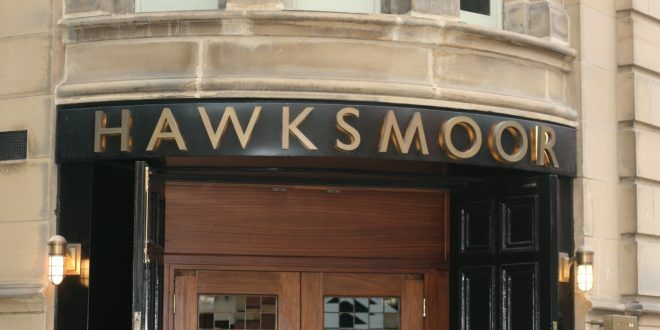 But already being a fan of Hawksmoor from trips to the capital I couldn’t wait for them to open up on Deansgate. The Grade II listed former Courthouse building is impressive. With its huge open kitchen and stylish decor. Shiny wooden floors, Victorian style tiles and expensive looking wood panelling. Even the less formal bar area – where we chose to sit – is smart. With more wood panelling, gold fittings and plush leather seats. 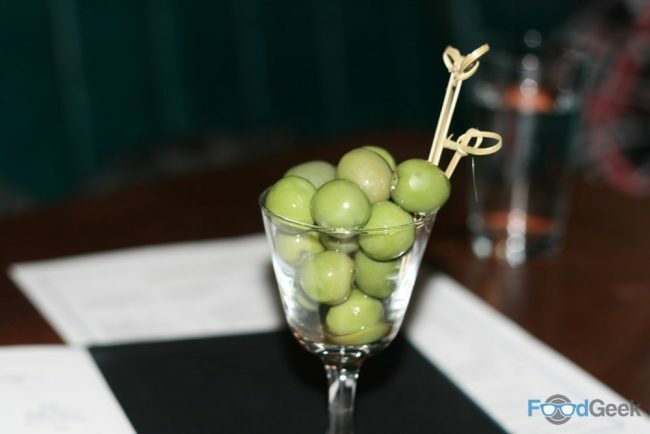 We started with some very nice, juicy olives. Although the bar has its own limited menu you can order from the main menu too. We made the most of it by choosing a range of dishes from across the two. First up, ‘Short-rib Nuggets’. 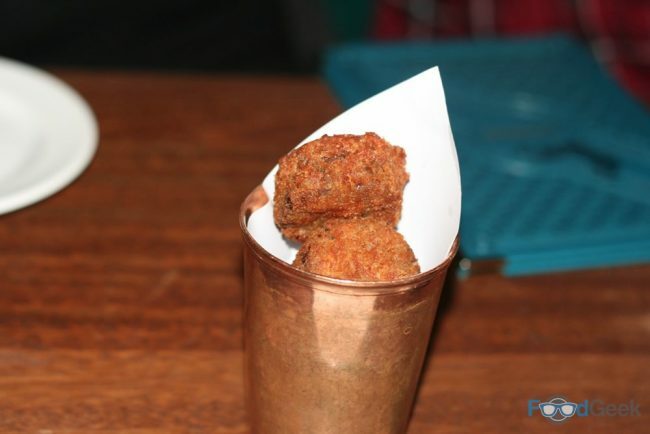 Fabulous deep-fried balls of melt in your mouth slow cooked beef with a creamy cheese centre. And a dish I’d never quite been sold on, ‘Poutine’. I always felt it was a bit trashy. Perhaps it is but I don’t care anymore. Not when it tastes this good. 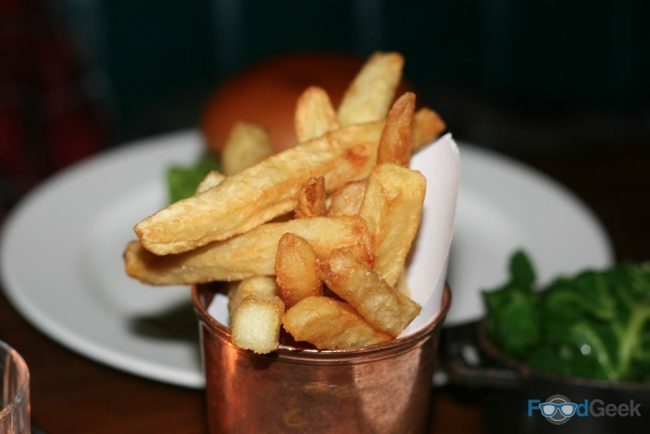 The chips themselves are great – triple cooked, naturally. They’re then drenched in rich beefy gravy and topped with cheese curds. I’ve been known to laugh at people ordering ‘chips, cheese & gravy’ in my local chippy. That’s essentially what this is, yet somehow it just works. 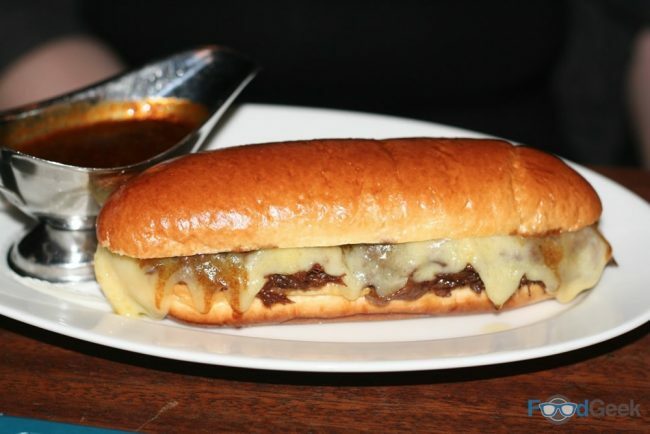 Followed by ‘Short-rib French Dip’, also known as the best sandwich on the planet. 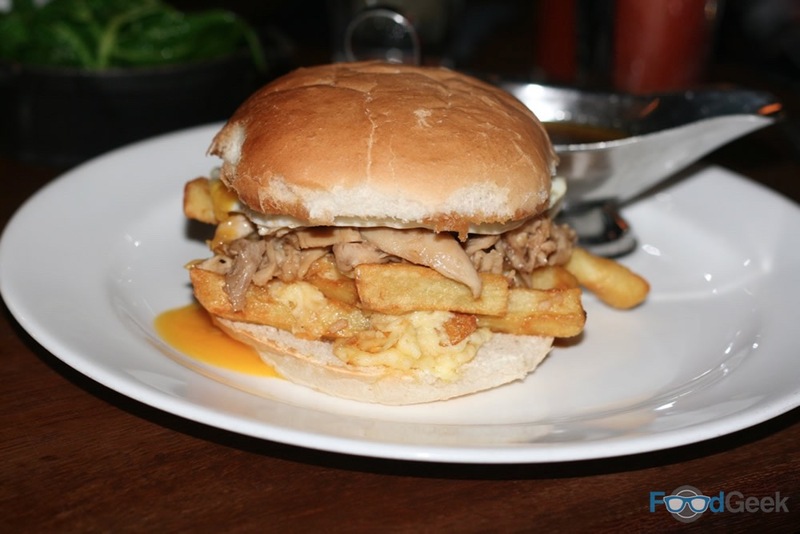 A sweet brioche bun stuffed with braised short-rib of beef, melted cheese and French’s mustard. Oh, and it comes with a pot of amazing bone-marrow gravy for dunking. I’d heard great things about the burgers. 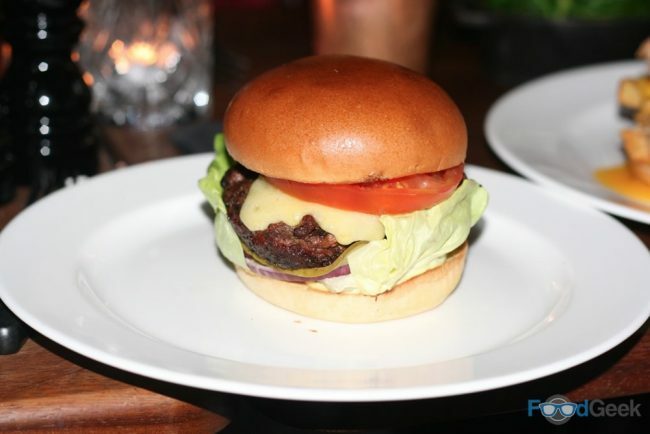 There are three on the menu, the ‘Hawksmoor Burger’ certainly didn’t disappoint. 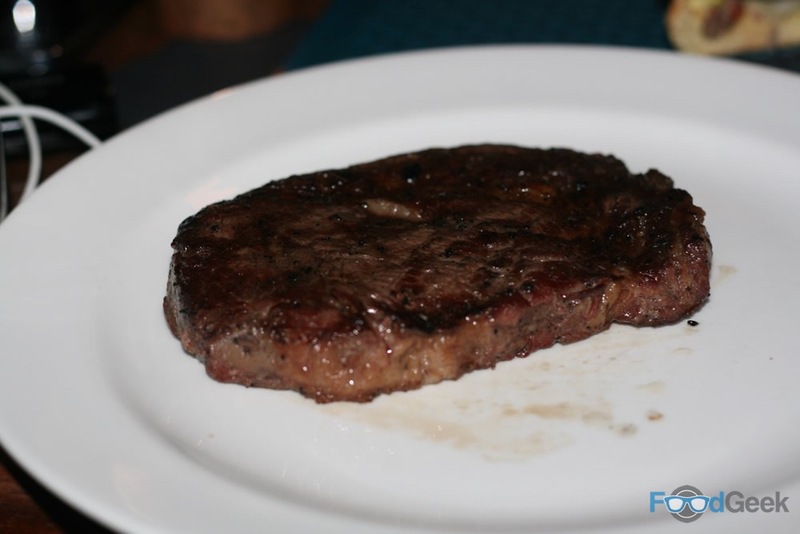 The substantial beef patty was cooked medium rare, super juicy but with a lovely char on the outside. Classically dressed with onion, lettuce and tomato in a brioche bun. It’s not big or clever, but it tastes great. 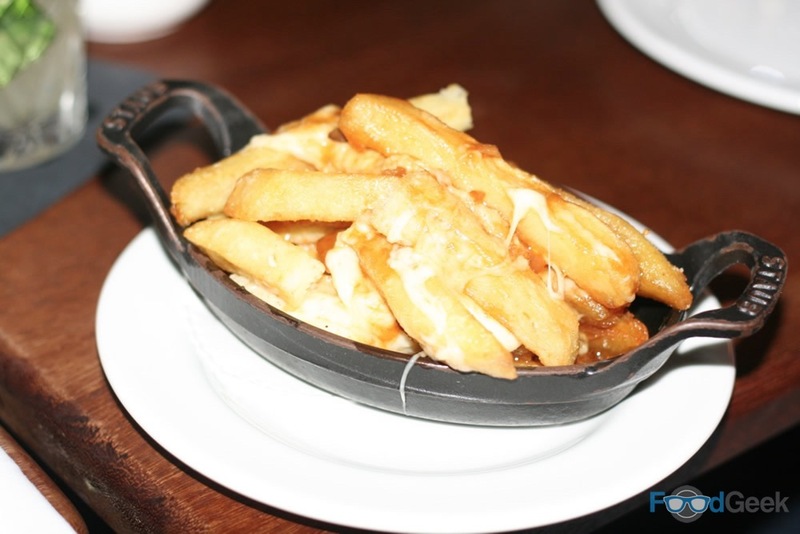 Remember how much I loved the Poutine? Well, it turns out it’s also pretty great on a barm (bonus points for the correct terminology) with chicken and a runny fried egg too! Who knew? As much fun as all those dishes were, you can’t go to Hawksmoor and not have a steak. I went for a Rib-eye, cooked medium rare. Which was exactly what I got. Unlike Gaucho who fly their steaks in from Argentina all the beef here comes from Yorkshire. I’m no expert so can’t definitively say if this makes a difference but I do know it was a really great steak. Charred and gnarly on the outside. The initial charcoal taste gives way to soft buttery pink beef. There’s plenty of marbled fat that’s just starting to melt and baste the meat. Accompanying my steak was the quite brilliant ‘Anchovy hollandaise’. 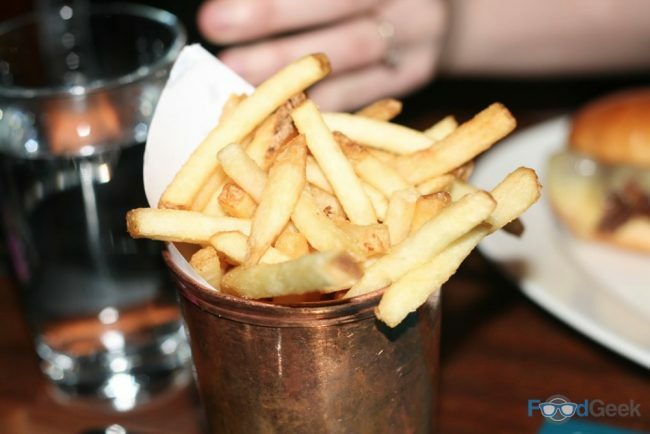 Along with ‘Triple Cooked Chips’ and ‘Dripping Fries’. Both of which were excellent, but surprisingly I preferred the latter. Oh, and a portion of ‘Spinach with Lemon & Garlic’ to make me feel a bit healthier. I can’t resist ordering Macaroni Cheese anytime I see it on a menu. That naturally extends to Hawksmoor’s ‘Short-rib Macaroni’. How do you make Mac ‘N’ Cheese even better? Just add rich, tender beef. The resulting sauce is a thick, sticky and meaty delight. 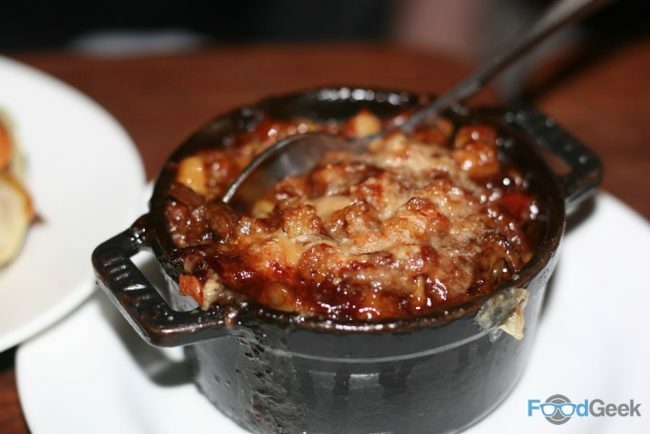 Comfort food at its very best. It would be fair to say that dessert definitely wasn’t required after all that. But I’m a sucker for both a pannacotta and a lemon tart. When I spotted both on the dessert menu – that I was ‘just having a quick look at’ – I couldn’t stop myself. The ‘Blood Orange Pannacotta’ was spectacular. Served upright on a plate (as they should be) to show off a most satisfying wobble. 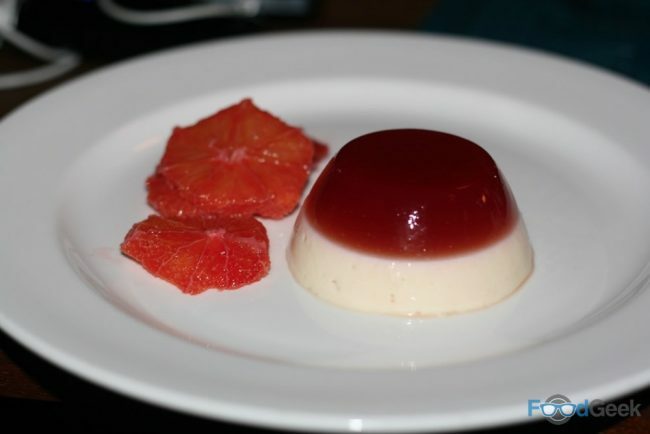 Perfectly round and smooth, topped with gleaming blood orange jelly. With more of the super seasonal citrus fruit on the side. 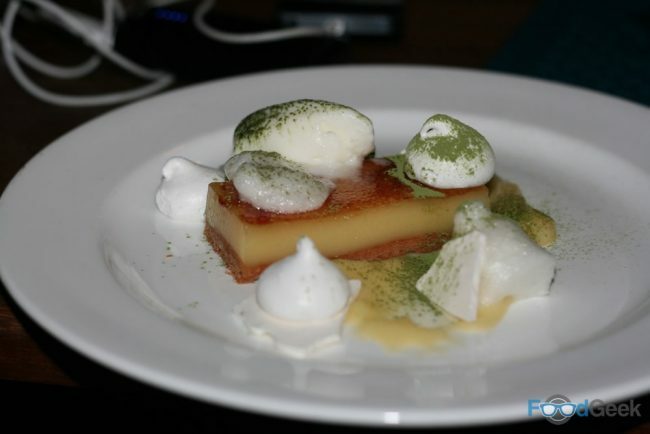 The ‘Lemon & Yuzu Meringue Tart’ looked like they’d been trying a bit too hard with the presentation. But it tasted unbelievably good. A superb combination of sweet and sour. A real mouth puckering sharpness from the citrus fruits was balanced by the sweetness of the lemon curd like filling and meringues. Yoghurt sorbet added a palate-cleansing freshness. 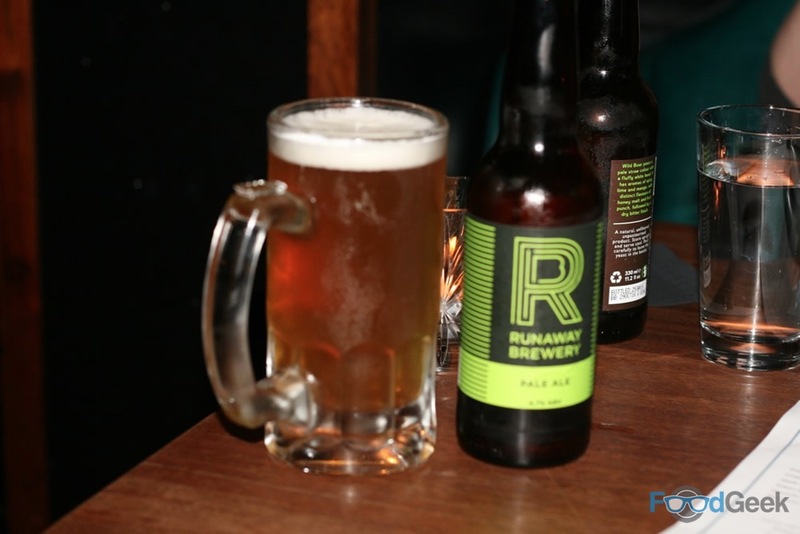 It was great to see a few quality beers alongside the excellent wine and cocktail lists. 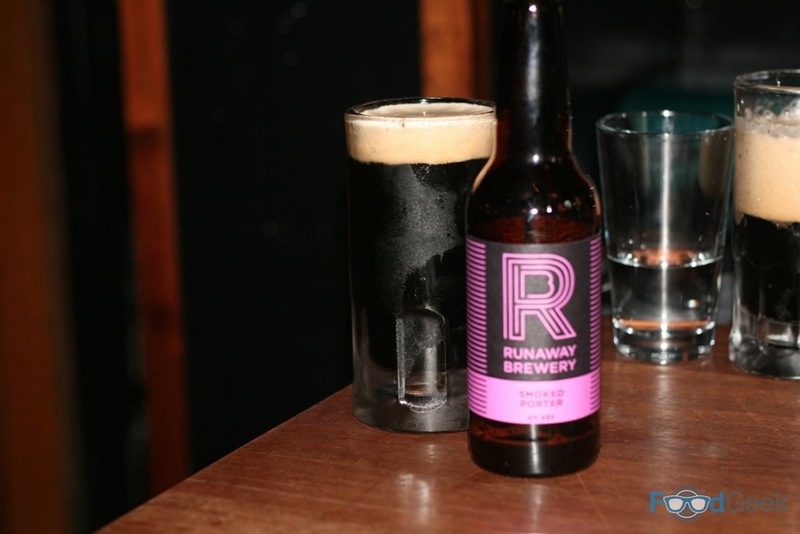 From the brilliant Buxton Brewery and local boys Runaway. Their Smoked Porter is fantastic with steak. Although definitely not in the frosted glass that it was served in! 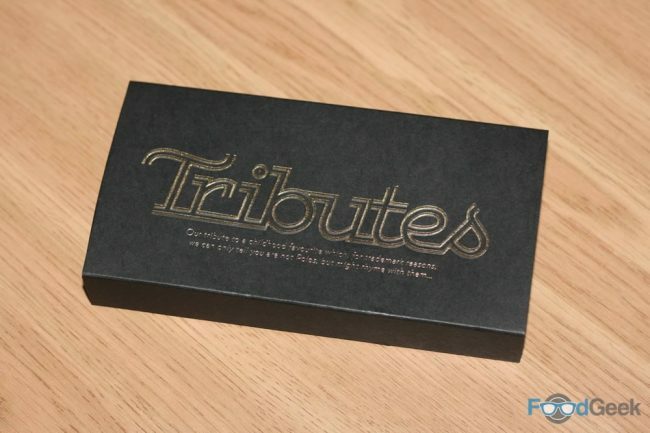 After paying the bill I was presented with a fancy looking box of chocolates. The waitress had overheard that it was my birthday (I didn’t mention it and Mrs FG was sworn to secrecy as I didn’t want a fuss). It was a nice gesture that I very much appreciated, though. Even more so after opening it the next day (I couldn’t possibly have eaten one at the time). They’re so good. 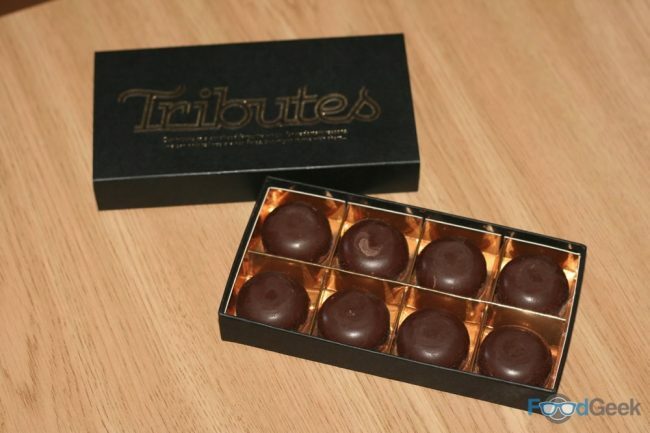 Essentially posh, slightly larger salted caramel filled Rolo’s. Needless to say, they didn’t last very long. 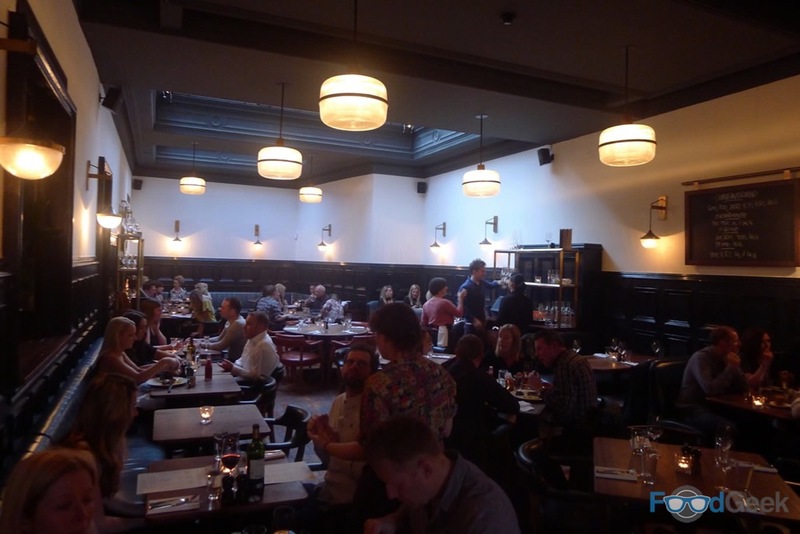 I loved everything about Hawksmoor. It was as good if not better than London and a very welcome addition to Manchester. It’s certainly not cheap – although the bar menu is really good value – but steak isn’t something to do on a budget anyway. Service was great as well, staff wear their own clothes which is an interesting contrast to the quite formal setting. It does seem to help maintain a relaxed atmosphere. It’s right up there with as one of my favourite places to eat in Manchester for special occasions. And I can see myself popping into the bar area for ‘snacks’ on a fairly regular basis too.